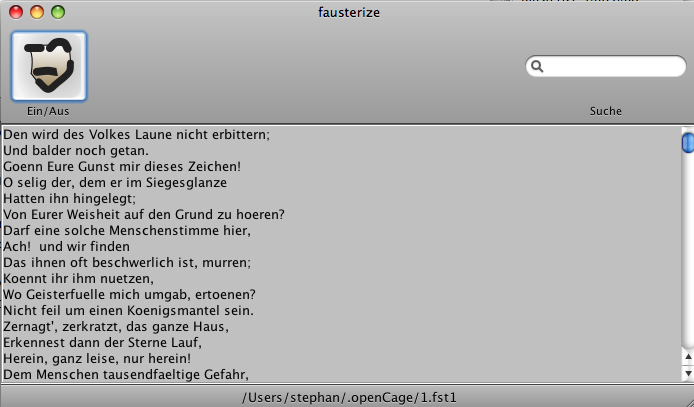 Fausterize is a simple text encryption program. I wanted a encryption tool with high security and easy to remember passwords. The password is a file, a file per document, i.e. fausterize employs a one-time-pad algorithm. I was looking for an encryption tools and wondered what would happen if I change the computer / os or the company of the encryption tool would go away. I did not like the idea, but I like coding so I started fausterize. The algorithm should be simple, os and programming language independent that it could be rewritten from scratch on OS/2 and Befunge if some one wants to. On the way I tried to think of ways to break the encryption. After all the regular encryption fausterize further encodes the bytes into lines of the novel faust by Goethe (thanxs to Project Gutenberg). This does not enhance security but it's neat. One positive effect is that the result could be send via email without triggering spam or virus filters. How to allow any file as pad file ? zip it. Packing a file produces byte steams that are sufficiently random. If not there would be further packing possible. using java zip this is simple, but what if the java implementation changes slightly? use your own packaging, i.e. a simple Huffman encoding should do it. The result of the decoding is either human readable text or garbadge. That allows a simple check based on mine-type content analysis if the pad file was correct. Summery: fausterize should be save enough to withstand statistical attacks or brute force attacks as long as the padfile is not on the machine.